Concerts on the Town | Where Outside Is In! You are currently browsing the tag archive for the ‘Concerts on the Town’ tag. Spring 2013 is on the Way…and it’s Bringing Events! Yes, chilly winds blow and snowflakes flurry down from the skies, but according to Punxsutawney Phil spring is on it’s way! The celebrity groundhog and Seer of the Seasons did NOT see his shadow, which means we get to dodge an additional six weeks of winter. We’re welcoming the budding season with open arms here at Reston Town Center, and want to remind you of all of the fun things coming your way! 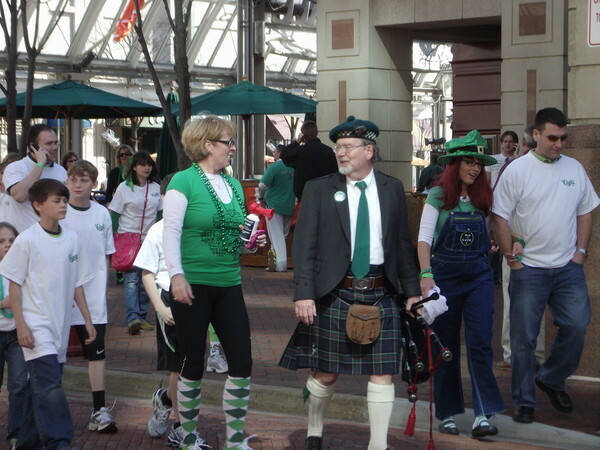 Spring kicks-off with Clyde’s St. Patrick’s Day Party! 4/17 R4 Collection Day – Reduce. Reuse. Recycle. Reston! 4/27 – 4/28 Great Grapes! Wine, Arts & Food Festival, produced by Great Grapes! We have lots of shows here at Reston Town Center; movies, art exhibits and concerts abound. Creating a community with family-friendly entertainment and activities is one of our biggest priorities. Families that play together stay together, right? One of our biggest musical events is the Concerts on the Town Series in the Pavilion on Saturday nights, June – August, hosting musicians of all styles. From big band music to bossa nova and red-hot Bayou music, along with reggge and doo-wop, you are sure to find a style that makes you want to dance along. And as you can see, most people bring picnics or lawn chairs and make an evening of it. Of course there are lots of other performances held in the Pavilion, like Mr. Knick Knack’s morning children concerts on Mondays from 10:30-11:15am and Community Concerts like School of Rock’s performances by future rock stars-in-training on Friday nights – all free! If you’re looking for something more interactive, check out Reston Town Center’s art scene. 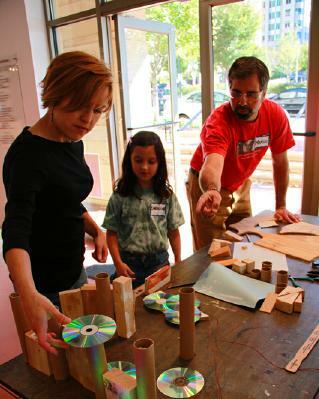 In its mission to engage the community in contemporary art, Greater Reston Arts Center has interactive art exhibits, art programs, and educational programs for all ages. Receptions and gallery talks are open to the public for each new exhibit, and they have extensive youth and family programs like family gallery weekend workshops where the whole family can create art together. 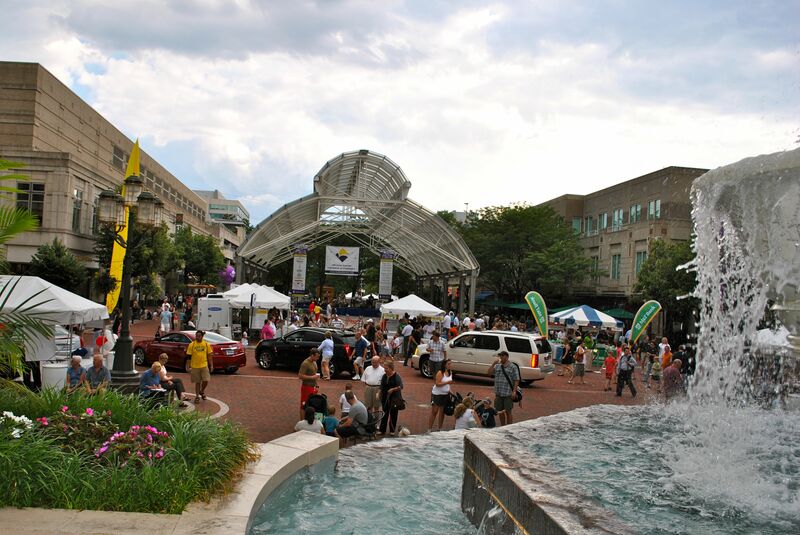 So instead of sitting on the couch watching TV this summer, grab those family and friends and check out the nostalgic, creative and fun events at Reston Town Center! Reston Celebrates Independence Day Weekend! Kick off the 4th of July weekend with the Radio King Orchestra as part of the Reston Concerts on the Town Series! 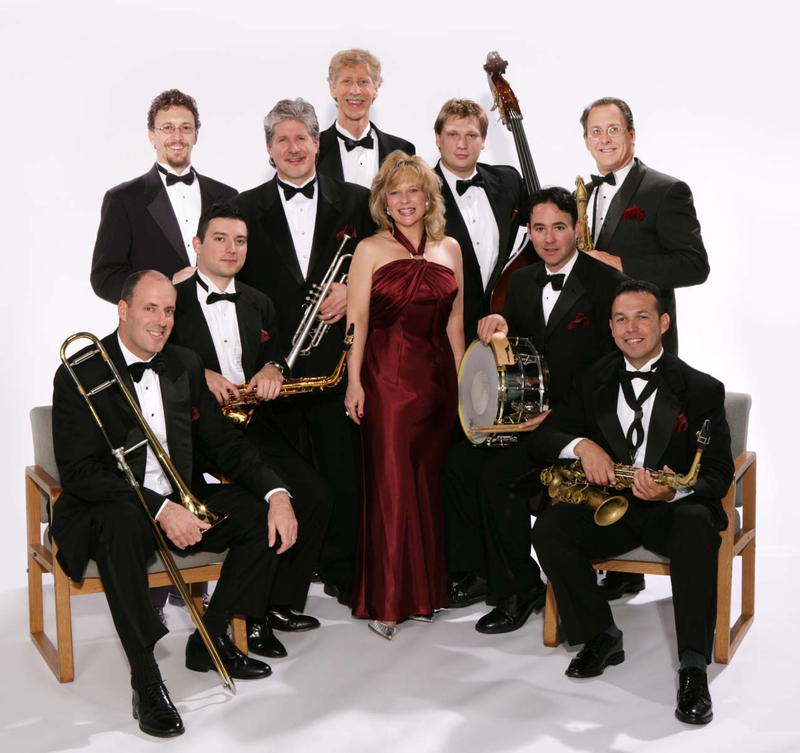 In the Pavilion, on Saturday, July 2, 7:30-10pm, settle down on your lawn chairs and picnic baskets for an evening filled with swing and big band jazz! Next on Sunday, July 3, head back to the pavilion to hear the music created by children and youth musicians gathered from all over the globe in the 7th Annual Youth Orchestra Gala Concert, 6-10pm. Leesburg’s own Youth Music Promotion and Preservation Association (YMPPA), is a non-profit educational organization established with the mission of promoting, supporting, sponsoring, and organizing music programs for children and youth. It is modeled after the Venezuelan system of youth orchestras, which has proved that music is an effective way to create positive change in society. Enjoy as these children share their talent and give their heart, for the purpose of improving our world and world relations. Happy Monday! Happy Fourth! Happy early bird freedom run through Reston! Prepare yourself for the day’s massive consumption of hot dogs, potato salad, and various festive drinks, by beginning the day with Potomac River Running and the Firecracker 5K! Nothing says independence like a morning run through the sloping streets of Reston. The race will start and finish at Reston Town Center. The course is a fast loop around the Town Center area on the local roads. Join us, bring the family and begin the July 4th celebration with a run! Commemorative, technical race t-shirts to all pre-registered runners, and food and awards after the completion of the race. A portion of the race proceeds benefit the =PR= Award for Excellence. There will be cash awards for the top 3 overall male and female finishers ($300, $200, $100) as well as for the top master runners ($100) and awards for the top 3 in each age group. 14 & under, 15-19, 20-24, 25-29, 30-34, 35-39, 40-44, 45-49, 50-54, 55-59, 60-64, 65-69, 70-74, and 75 & over. 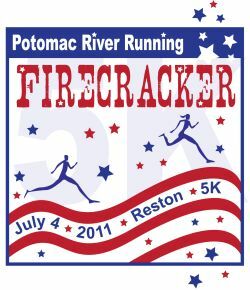 For more information visit www.potomacriverrunning.com. 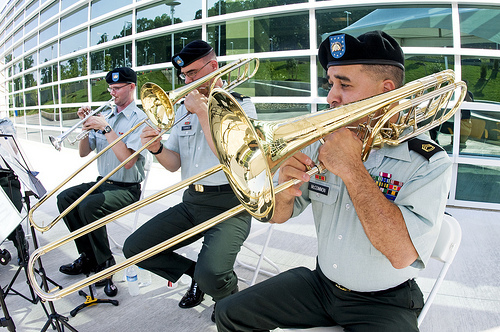 Before the fireworks light the sky get your American spirit revved with the patriotic tunes played by the 257th Army Band in the Pavilion Monday, July 4, 7:00pm. The “Band of the Nation’s Capital,” the 257th Army Band, boasts a proud lineage going back to the legendary Corcoran Cadets of 1883, the DC militia that inspired John Philip Sousa to compose his march of the same name. Through a series of mergers with other organizations such as the 121st Engineers in 1921, The 260th Costal Artillery Unit in 1939, and ultimately the 91st Army Band in 1959, the ensemble faithfully continues to provide musical support for the Washington DC National Guard while proudly representing both the Guard and its home city throughout the world. Enjoy these exciting concerts and events this weekend at Reston Town Center, and from us to you, Happy Fourth of July! 2010 Summer Lineup is Here! Come celebrate the 20th birthday of Reston Town Center all summer long by dancing to great live music in the Pavilion every Saturday night. Reston Concerts on the Town, the weekly summer concert series at Reston Town Center, will kick off its summer season on June 5 with the swing and big band jazz of local favorites Radio King Orchestra. The concert series kicks off the first Saturday in June, and continues every Saturday night through August. 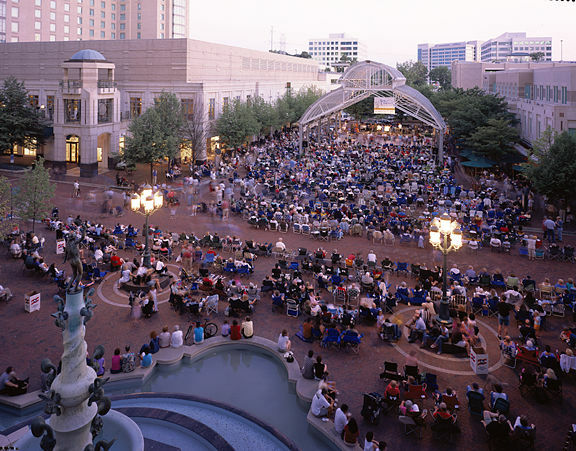 Reston Concerts on the Town is a free concert series that takes place at the Reston Town Center Pavilion every Saturday night, June 5th thru August 28th, from 7:30 p.m. – 10 p.m., rain or shine. Featuring talented local and national acts, the concerts are sponsored by the Reston Town Center Association with support from the Fairfax Times. This year’s line-up features a diverse array of music including swing, jazz, Celtic, Latin fusion, New Orleans zydeco; Afro-Cuban, and Motown. Music lovers of all ages are invited to bring blankets, lawn chairs, and picnics to the concerts each week and come ready to have a swingin’ good time. For more information about this series, please call the concert hotline: 703-912-4062. Reston Town Centeris an acclaimed outdoor venue offering more than 50 retail shops, 30 restaurants, and a 13-screen Multiplex cinema. At the Center’s hub, the Pavilion hosts special events, concerts, festivals throughout the year, and ice-skating in winter. For more information, visit www.restontowncenter.com. The full summer concert line-up is below. Free concerts throughout the summer! Please note: Other than the June 19th Taste of Reston, alcohol is permitted at restaurants only.